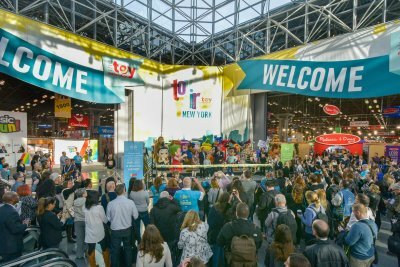 The 2019 International Toy Fair in New York City officiall opened yesterday, and most of the big announcements have been made, with the products shown, and photos splashed all over the internet. Since your PopCulteer did not attend the big show this year, I’m going to do my best to round up as much news as possible about all the cool pop culture collectibles coming your way this year, with some analysis and plenty of links (and borrowed images) to bring you up to date. This long post is just our first installment. Sunday Evening Video is taking the week off, but we will have a special video presentation later in the week. You can find the latest news on what Hasbro is doing with Marvel Comics HERE, with Star Wars HERE, Transformers HERE, and with Power Rangers HERE. I will post links to what Mattel is doing with Barbie, WWE, DC Comics and more after they have their blogger breakfast meeting Monday, and more information is available. It will also take a while to dig through all the reports to find out what’s happening with Frozen 2, Toy Story 4 and the other big movies coming out this year. Over the past few years, one trend that seemed almost to become the rule this year is that we didn’t get a lot of surprises. The major toy companies started leaking information about their offerings days, and even weeks, in advance. 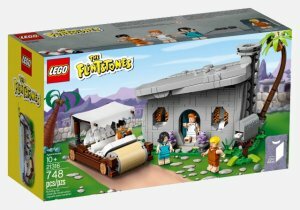 Even LEGO, who had a major surprise with a construction set based on The Flintstones, had leaked word of that in January, even though they just unveiled the product to the public Saturday (that’s it, seen left). The usual suspects are out in full force at Toy Fair 2019. Everybody who can secure a part of a license is offering product based on the heavy hitters: Marvel, WWE, Disney’s Frozen 2, Pixar’s Toy Story 4, Star Wars, and DC Comics, and the second tier, but still profitable properties like Universal Monsters and all things horror, KISS, Star Trek, Hanna Barbera, and retro toy lines. That last catagory, retro toy lines, is both near and dear to my heart, but also a little disappointing this year as I seem to have aged out of the target demographic for such efforts. Yours truly grew up at the end of the 1960’s era of super-cool toys like the original GI Joe, Captain Action, Johnny West, and Major Matt Mason. So far I’ve only found news of one company offering collector figures in the 1/6 scale that I collect, and that’s the very excellent and very expensive Quantum Mechanix. You can see their offerings for Star Trek, It, Supernatural and more HERE. In the 1970s I was still young enough to enjoy The Adventure Team GI Joe, Evel Knievel and the MEGO World’s Greatest Super Heroes, but as with most people my age, by the time MEGO started licensing every property known to man, and then Star Wars came out and lowered the bar for what an action figure should be, my interests were turning to girls and cars. However, my mom ran a daycare center, and I was there almost every day, and therefore got to see several waves of “hot toys” that kids had to play with over the next twenty years or so. I remember realizing that the Star Wars figures existed to sell the larger vehicles, and that’s why they were so tiny and barely-articulated. I understood why they were the way they were, but thought the figures were crap. Later, the revived Real American Hero GI Joe showed that you could make quality, articulated figures in that small scale. But most companies who scaled down to that size didn’t bother, and the results were underwhelming. Likewise, when He Man and the Masters of The Universe first showed up, I was stunned at the sheer idiocy of the concept, the name, the cartoon, and the design of the toys (I was also about as far from the target audience as you could get). So I have no fondness for that toy line at all. I understand that people who grew up with that will love it forever. I grew up with the Batman TV show. It’s about as silly and stupid as TV shows get, and I will love it to my dying breath. That’s how nostalgia works. So if I seem dismissive of certain types of action figures, just remember that I’m showing my age. 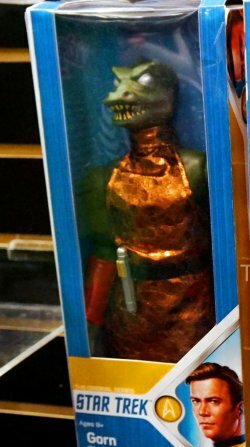 Not every toy can be as cool as a new MEGO 14″ Gorn (seen above). So sadly, this year the trend in retro toys is to go back to the style of toys that were made during the time I had little interest in then-current toys (and I have to admit here, that once I rekindled my interest in toys as an adult collector, I started paying attention to the whole toy industry again, so my disinterest was just a phase). While there is some great stuff out there, and I can admire it for what it is, at lot of it is stuff I can leave out of my personal collection. It’s cool, but the toymakers aren’t aiming at folks my age for nostalgia anymore. The “Sweet Spot” for toy collectors now encompasses people ten to thirty years younger than I am. 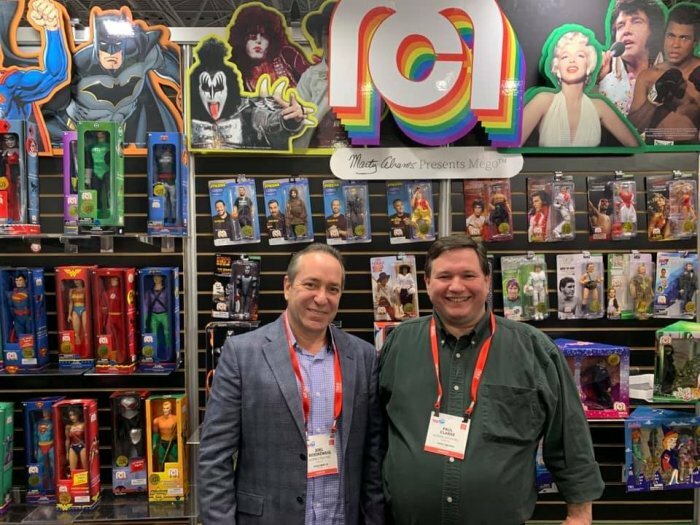 Joel and Paul, from MEGO, in front of part of the MEGO booth at Toy Fair. As I have mentioned here before, MEGO made a triumphant return to Toy Fair after more than three decades in limbo, and showed off plenty of new product, although they had leaked much of it beforehand. Over the past couple of weeks they told MegoMuseum about 14″ version of their Star Trek and KISS figures, but at Toy Fair they were able to show them off in person, along with a few new 8″ figures, and one entire new line, Heads Up!. MEGO also showed off 14″ tall versions of Bruce Lee, Jimi Hendrix, KISS and Star Trek, and posted images on Facebook. 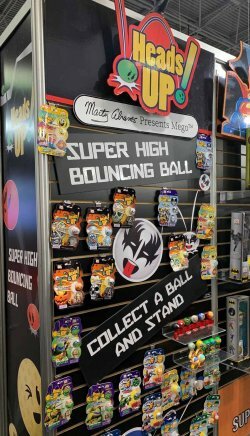 Plus they took the wraps off of Heads Up!, which is an inexpensive line of hi-power bouncing balls that come with stands. The balls are recognizable heads from pop culture, including Marvel Comics, Teenage Mutant Ninja Turtles, KISS, SpongeBob Squarepants, Beavis and Butthead, South Park and others. Set to retail for under five bucks, this could be a surprise hit. It’s a cool product that doesn’t take up a lot of space, and it has recognizable characters plus play value. You can see the Heads Up! display at right. In a few days we’ll cover the other companies that showed 8″ MEGO-style figures at Toy Fair. The real big trend in retro toys this year is one that, I have to confess, does not push any of my buttons. Toymakers are marrying the worst elements of the original Star Wars action figures–simple sculpts and only five points of articulation– to dozens of pop culture properties. Some of them, to be honest, do look great, but these also seem to be designed to be kept in the package, since they don’t offer much in the way of play value. ToyArk has some of the best photos, and I suggest you visit this link to see their latest photo galleries. 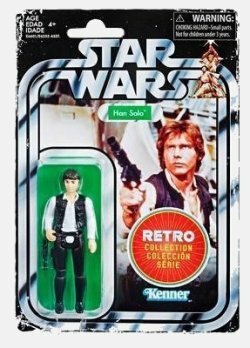 Even Hasbro has jumped into this segment, reviving the Kenner brand to release Target-exclusive retro Star Wars figures that look every bit as lame as the originals. I’m sure these will provoke squees of delight from the folks who loved them as a kid. For me, it’s an easy thing to pass up. I realize that there are people who hold this type of figure in high regard, but I just can’t count myself amongst them. To me, these recall a time when bean counters took over the toy business, and sacrficed size and articulation at the altar of profit. Profit does drive the toy industry, of course, but when I was a kid, I wanted toys that could be played with, instead of just being three-dimensional trading cards for movies and TV shows. Mezco is getting into the game with their 5 Points line, and the stuff looks cool, but gets an easy pass from me at the same time. 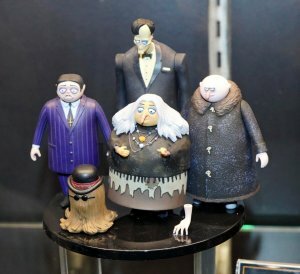 At Toy Fair they showed figures based on Scooby Doo, The Warriors, Space Ghost and Birdman, The Six Million Dollar Man and The Addams Family, which is based on Charles Addams’ original designs (right), and might actually pry some money out of my wallet. You can see ToyArk’s photos of these HERE. The folks who kicked off this trend with their ReAction line (which spent a few years licensed to Funko before returning home), Super 7, showed off an impressive assortment of new licenses, which will all take the form of tiny, barely-articulated figures. If you are a fan of Pee Wee’s Playhouse; Beavis and Butthead; Planet of The Apes; Alien, Masters of The Universe; Universal Monsters; 80’s movies They Live (prototypes seen at left), Breakin’ and Teen Wolf; metal bands Iron Maiden, Motorhead, Ghost, King Diamond, Ozzy, Megadeth, or Slayer; and a couple of other properties, then you might be tempted by these poorly-articulated figures. To be fair, many of them look really, really good, as you can see at ToyArk. Funko is going even further into retro land with several lines of figures produced in the ludicrous He Man style, including DC Primal Age, which at least as a good comic book tie-in. You can also find Funko’s “Savage World” He Man style figures of horror icons like Freddy Kreuger, Jason Vorhees and Leatherface, as well as ThunderCats and Street Fighter. Once again, ToyArk has the photos. 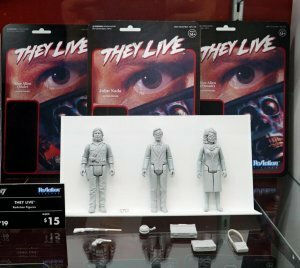 PopCult will continue to update you on the latest news out of Toy Fair all week long. A Metaluna mutant Soaky type figure?!? I need that!! !